I read with interest your column in Sport Diver, and have a question for you. My father, sister and brother all have marked alpha-1-antitrypsin deficiency(genetically predisposed deficiency of a protease inhibitor), predisposing them to emphysema. I have only a mild deficiency, and I have been diving for five years without problems, although I avoid technical diving. My question regards my younger brother, who is 17 years of age, and is in good general health and does not smoke. Is recreational scuba diving going to be contra-indicated for him, or is it reasonably safe to recommend him to take it up? Alpha-1-antitrypsin deficiency is one of the commoner genetic disorders but is still rarely found. Basically it is a lack of the protein of the same name which has the function of keeping in check another protein called neutrophil elastase. The purpose of this is to digest ageing lung cells or bacteria in the lung. The problem with neutrophil elastase is that once it gets going on these cells it will go on and destroy the healthy lung cells unless the alpha-1-antitrypsin is there to stop it. So people with a deficiency of this will go on and get permanent lung damage, called emphysema. But the question in your brothers case is how deficient is he, and does this deficiency mean that he will definitely get emphysema, and if so when? Some research shows that even if he has only 15% of his expected level of alpha-1 then he may well not go on to get emphysema. On top of this there is a replacement treatment called Prolastin that can slow down the lung damage to the same levels as the rest of us. If he has got any lung damage it would be fatal to dive, as the emphysema results in air pockets in the lungs. This means that air inhaled would not be able to be exhaled and would expand on ascent resulting in pulmonary barotraumas and CAGE as with the asthma question. So the question is, exactly how bad is your brothers deficiency, has he been on any treatment and are there any signs of emphsema yet, despite his young age? As you say it is "marked" then I guess that he is a bad case. Lung function testing and X-rays can tell how bad any damage is. But the only hope would be that if a Respiratory Physician were to be able to 100% guarantee that there were no lung effects yet then he may be fine at this stage. However most docs wouldn't risk this sort of call to sign off a diver, so sadly it may be better if he pursued another sport. Can you confirm what range or percentages a normal result from a lung function test falls into. I've started doing a lot of yoga including breathing exercises and my most recent medical showed I was exhaling 115% of my predicted capacity. My yoga instructor has just done her open water training and her result read 170%. Does a higher than average lung function have any advantages or disadvantages when diving? Big lungs are generally better for diving (less gas consumption, in theory) and you tend to find that people who dive regularly (such as commercial divers) get progressive increases in their FVC (forced vital capacity, which approximates to your total lung capacity). Most divers tend towards an increase in FVC with age but the general conclusion, that divers tend to have larger vital capacities than non-divers, was not confirmed by a study of 126 saturation divers by Thorsem et al (1989). They suggest that the increase is transient and that later there is a greater decline. Any change of vital capacity probably has little effect upon the diver’s general health. There have been some studies that suggest divers develop a degree of air flow obstruction due to airway narrowing over the long term. However more recent studies have not confirmed this, and actually in a group of military divers there was no evidence of obstruction compared to non-divers. In divers who smoke however there was a much more marked decline in lung function so there’s an obvious message there. Some swimmers and divers I know use resistive training devices such as the PowerBreathe to improve their lung function and there is good evidence that this helps asthmatics – it helps strengthen the inspiratory muscles and produces similar changes to yoga breathing exercises. So adopt that Wind Relieving pose, stop smoking and watch your lung capacity and bottom times soar! I was first diagnosed with Synovial Sarcoma in '92, a 2cm lesion on external fascia of right rectus sheath. Broad excision completed Sep '92 No further treatment, but Scans for 5 years. In July 2004, noticed a lump in left thigh, CT of thorax showed huge mass in upper lobe of right lung. Resection of thigh lesion 13 Aug 04, Lobectomy Sep 04. Began 6 cycles of high dose Doxorubicin/Ifosfamide in Oct and completed Jan 05. Have discovered further lesions in right thigh, all those big enough to remove have been (2 weeks ago). No ongoing medication, but potential for further chemo (Gemzar/Taxotere……maybe ET742) as things develop. I was told by my thoracic surgeon that I'd be ok to dive 6 weeks after the lobectomy, although naturally, didn't dive during chemo (too weak, too much neutropeania!). However, since chemo finished, I've completed 30 dives, (max 38m) as well as my PADI EFR and Rescue Diver courses. My last thorax CT (3 weeks ago) was squeaky clean. I have pristine lungs (what's left of 'em), no bullae, and excellent lung function. The reality is that I'm likely to have further mets, and that this disease is going to kill me. But I'll be damned if I'm going to sit on my arse and watch it happen, so whatever happens, I WILL be diving again. However, to dive where I want to, with the people I want to, they have implied that I need a medical (purely because of the lobectomy), and I'm a little cautious about that. From what I understand, and my experience to date, I genuinely don't believe that I should be barred from diving (at this stage…different if I get more lung mets). Could you give me your opinion as to where I stand? I'm very grateful for your advice! A sad tale. Well done for coping with everything thrown at you so far. A lesson to us all. In your situation, where you are going to dive anyway, as you say, then we have to be rational. If your surgeon feels you are fit, and there is no risk that an undiagnosed metastasis will affect you. [i.e one that appears before your next scan] then you should approach an empathic dive doc and get some lung and blood tests to make sure you wont be a risk to a buddy. I think if you are going on a dive holiday, then get a check up, as well as a scan if you can as close to departure as possible. I assume you have enough power in your legs after all that tissue removal, if not consider a DPV. Finally some chemotherapeutic agents can affect the lung structure, so the lung tests are the real deal here. Get to a doc, and work up a good relationship as you may be better off having 3-6 monthly medicals. My boyfriend has recently been diagnosed with sarcoidosis, bit of a nightmare as we are divemasters and have flights booked to Thailand to do our instructor course. He has seen the specialist and his lung function tests are better than average, but he has a small amount of scarring on his lungs. He has never experienced any symptoms and we probably never would have known if it wasn't for a chest x-ray needed for Aus visa (which apparently we now can't have, but that's a different nightmare). The specialist has told him that it will probably go away and no treatment is needed, but the big question is can he dive? Your website is most helpful and your comments would be appreciated. This is a funny old illness of unknown cause which is extremely variable in severity and duration. It gives rise to "granulomas" (small nodules of inflammation) in any organ, but most commonly the lungs and lymph nodes. Young adults of both sexes are typically affected, peaking in the 20-29 age range. The symptoms are often vague at first – fatigue, dry eyes, a cough, general aches and pains – the sorts of things young adults dismiss, so the diagnosis is sometimes delayed. As in this case, most sufferers are picked up on chest X rays or breathing tests performed for another reason. You see a classic shadowing on the lungs caused by big lymph nodes in the early stages, but this can evolve into more serious lung disease. And this is why diving might be a problem – our old friend pulmonary barotrauma. Active sarcoid can cause scarring or air trapping, predisposing a diver to burst lung. Treatment usually involves steroids or other immunosuppressant drugs, but mild cases often remit without therapy. The hope in your boyfriend's case is that, given time, the lung changes will clear up, but it could take many months. My advice is not to dive until you have a clearer idea of the course of his illness. I would like to know if you can give me some advice after having pneumonia and a pleural effusion. I went to A&E after breathing difficulties & coughing up blood (only small amounts in a tissue over 12 hours). I was kept in for 4 nights & treated with antibiotics (clinical presentation said pleuritic chest pain & haemoptysis) then sent home with a follow up appointment in 6 weeks. At this appointment I was told that I had a pleural effusion after an episode of pneumonia and had 660 mls of clear fluid drained from my right pleural cavity (ie. not from inside the lung). After a follow up appointment a couple of months later I was told that there was still fluid present but that they would like me to try and get rid of it naturally over time rather than drain or syringe it out. I was told by the non diving doctor that providing my fitness was OK then there would be no problem diving. Would it be possible for you to confirm this please? I currently only dive in warm water on holiday. A pleural effusion is a potential complication of pneumonia, but one that will often clear up by itself (if the volume of the effusion is not too large). Just to get the anatomy clear (as you know I’m a stickler for these things), the pleurae are membranes that cover the inside of the chest cavity and the surface of the lungs, forming one continuous lining. The space in between the two layers usually contains a small amount of fluid (3-4 teaspoons or so), to lubricate the movement of the lungs against the chest wall with breathing. Normally surface tension holds the two layers close together, allowing the lungs to expand maximally. If 660 mls of fluid accumulates in this space it effectively squashes down the lung tissue, so reducing the surface area over which gas exchange can take place. So less oxygen makes its way into the blood, and if you factor in the increased work of breathing at depth, then it's easy to become dangerously low on oxygen in this situation. 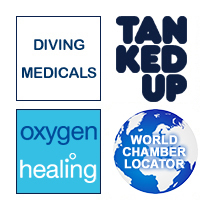 Before you dive again it would be important to ensure that all of the fluid has been reabsorbed, and there is no significant scarring of the lungs. This is probably going to mean some X rays to ensure the lung fields are clear, and a set of lung function tests. You might be able to organise these via your GP, but you may require a visit to a local dive doc to get your fit to dive certificate.